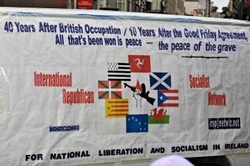 The Bay Area comrades of the International Republican Socialist Network are once again calling upon the Left community--Socialist, Communists, Syndicalists, Anarchists, and other Anti-Imperialists--to join the IRSN's Anti-Imperialist Contingent in the San Francisco St. Patrick's Day Parade. The parade will occur on Saturday, March 12th, at 10.30am this year (earlier than normal). The assembly point is on 2nd Street between Bryant and Brannan Streets.The IRSN's position number in the parade is 110. The IRSN will once again participate with a decorated van, this year paying tribute to the memory of the the three Irish National Liberation Army volunteers who lost their lives on the hunger strike, 30 years ago in 1981, along with their seven comrades from the Provisional Irish Republican Army. However, along with the van will be a marching contingent of our comrades from other groupings and tendencies of the Left. Those interested in handing out flyers promoting the anti-war demonstration occuring in March are encouraged to bring copies to hand-out to those watching the parade. Participants are welcome to bring identifying banners, though additional banners and placards will be available from the IRSN as well. As always, participants in the Anti-Imperialist Contingent will be welcome to attend the IRSN's after-parade party, where the traditional Irish combination of Nachos and Margaritas will be served.